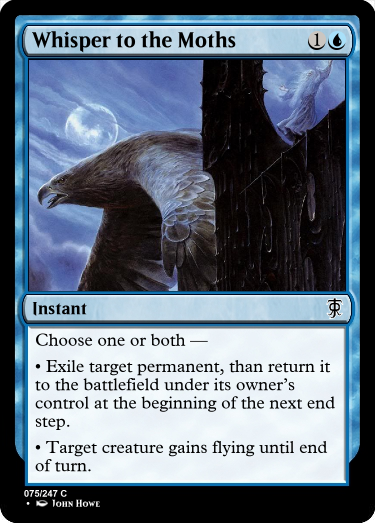 (b) The set must be consistent, playable and draftable. 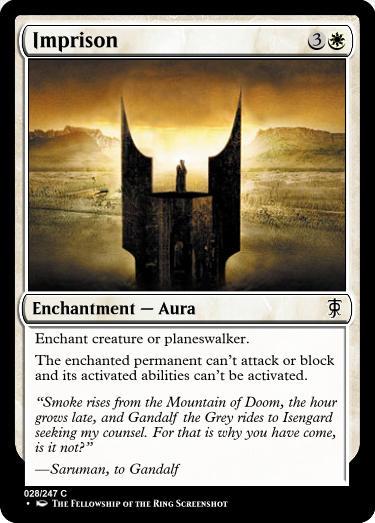 What i mean by that is that for example, even if it would be reasonable to put, let's say, the ability "madness" on the creature of Denethor, this can't be done unless a chunk of the set present the madness ability and some madness enablers. 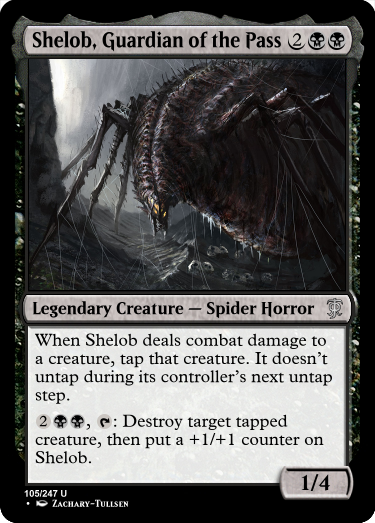 Shelob grows eating her prays, but she cannot do much agains the power of the vial. 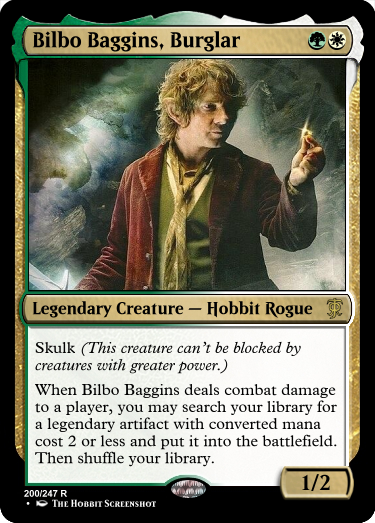 Turns out that Bilbo found a lot of legendary trinkets, so why don't make it a sneaky treasure-hunter? If someone has some idea of interaction to be implemented, please let me know! There is one massive issue I want to point out, though: Fellowship doesn't work. Ability words have no rules meaning whatsoever (see Comp. Rules 207.2 & 207.2c), which means they cannot be referred to. They are basically just reminder text. Yeah, having an ability that basically does nothing except allow to be referred to would be weird. But WotC has found a way to do so in the past: With subtypes! 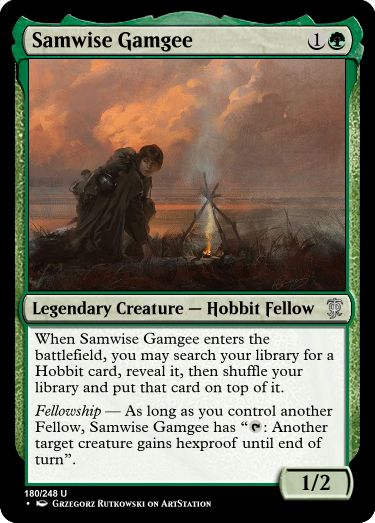 You could add the Fellow creature type and change the ability to: "Fellowship - As long as you control another Fellow, <effect>" It even shortens the wording - not sure if the typeline could handle it on all other cards, though. That's actually an interesting idea, although I don't like it completely. Must be one of the few way, though. Another option would be something simple like "Fellowship N (This gets +N/+N as long as you control ?? other [nontoken?] creatures.)" 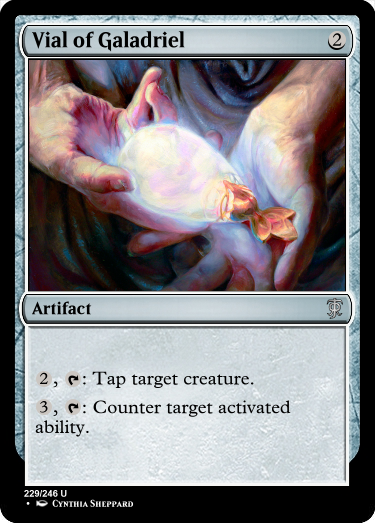 It's simple but flavorfull and not parasitic - and would allow to be referred to by other cards..
At first glance (at mostly the name) Fellowship made me think of Soulbond, but Soulbond doesn't need the other to have Soulbond; what's similar is that it bonds creatures together, and they're giving (each other) traits based on activation of the ability. Anyhow, be careful with alternative wincons (and making them too easy to get), as it can make the opponent feel very cheated. Alternative wincons are often very hard to attain and require a deck to be build entirely around it and still be not-very-viable. 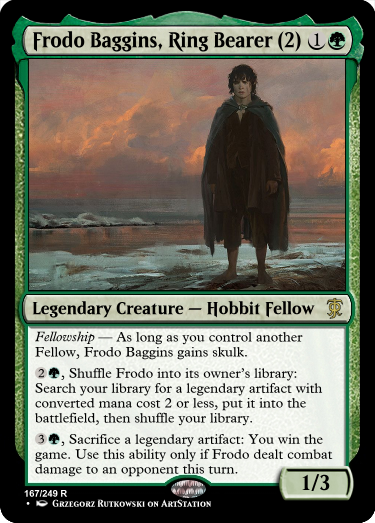 You'll have to playtest how easy it is to win with your alternative wincons, and in which formats your set will care about (because, for example, making Frodo a Commander could be pretty OP as you simply put it back into the command zone). My three cents. 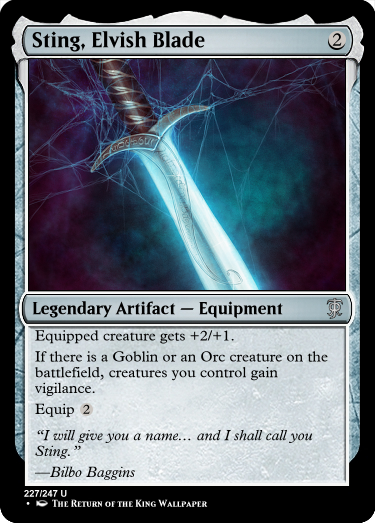 I liked the Shelob-Vial interaction when against each other, but also when they are owned by the same person. Frodo wants to win, and Sam, Merry and Pippin help him out by searching it back from the library (sam) and repeat it again (merry and pippin). 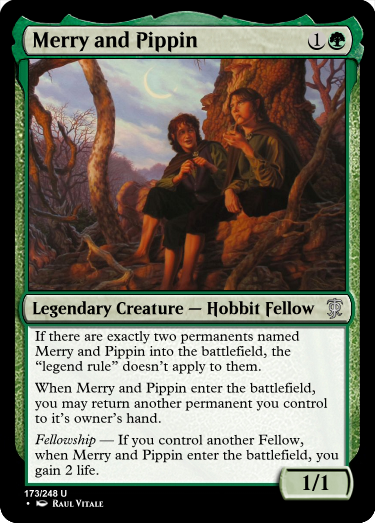 Plus, Merry and Pippin have some nice interation with elves and ent which I made with a lot of ETB effects. 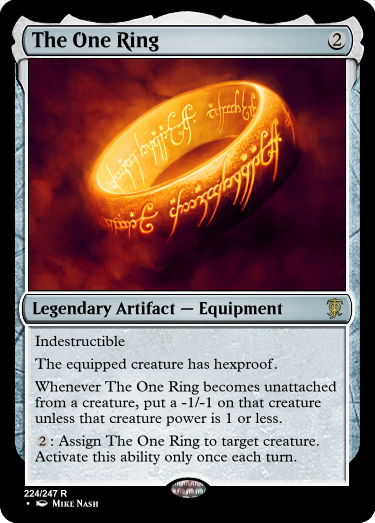 I'm not sure the nine-lines text is worth on an uncommon though. Not sure of the power level balance either. - eowyn is also kinda weak. 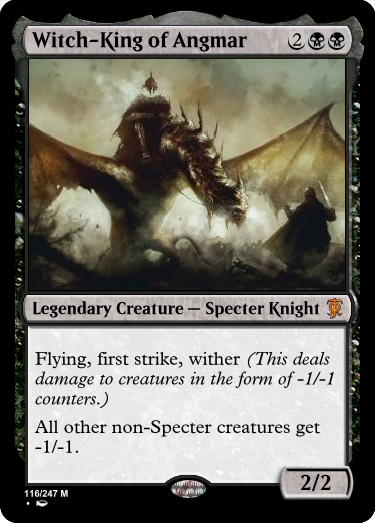 a legendary vanilla bear that you have to pay more mana (the equip/aura cost) in order to transform into a creature that's a lord for a keyword that'll probably only be in the set a few times? 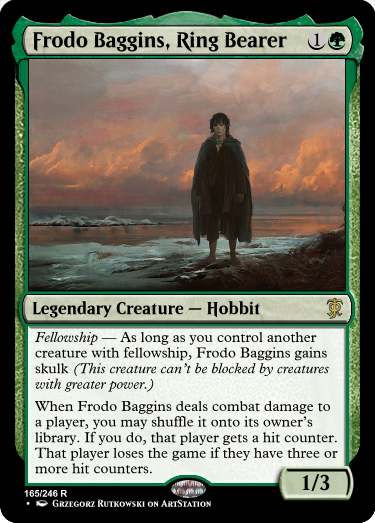 - Suggestion for Frodo: "Whenever Frodo deals combat damage to a player, you may pay <cost> and sacrifice a legendary artifact. If you do, you win the game." 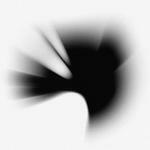 and have it shuffle itself into its library for profit some other way if you want to have that as a mini-theme? Thank you very much for the feedbacks. I had thought of making the hobbit as Kithkin, but I have decided agains it and now I think it's better to leave them "hobbit" as a new race. About the Fellow/Ally thing, I have to think about this; I'm not sure I like it neither way. I'll think about a solution but for the time being it's not a crucial thing to fix. 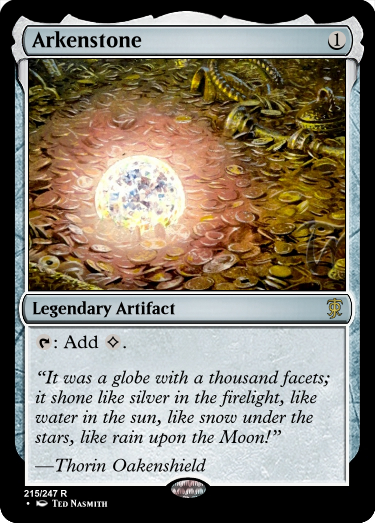 Legends as uncommons have the main purpose of enable most of the sinergies I have thought of a little more often than normal, in a draft/sealed or something. As you rightly said, it would be a waste to not use them to enable some mechanic, and I have think about this in the past. 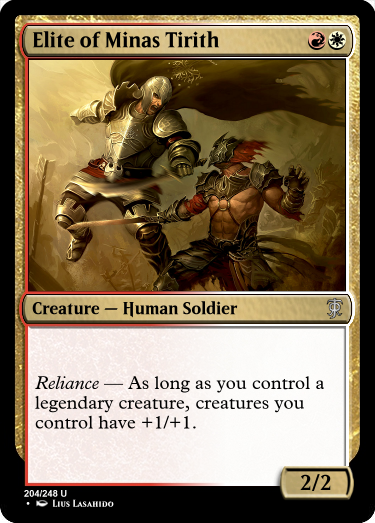 I come out with a mechanic called "Reliance" which is the Gondor-faction mechanic. 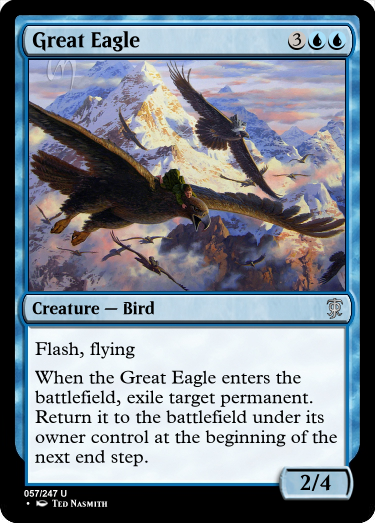 Merry and pippin may seems week but I think they can be very strong to enable the ETB triggers of other cards, plus if you have two copies of it you can bounce them back and forth and gain life in the process. I don't know if I'll dare boost them up. Maybe just turn them into 2/2... I'm very open to suggestion anyway. 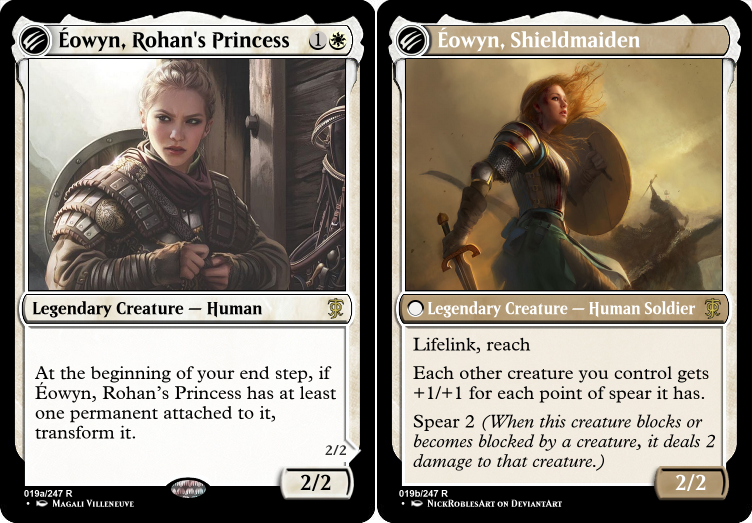 I would also consider suggestion to make Eowyn a little stronger. The ability oin Sting need to be fixed as "your opponent control". You are totally right on it.